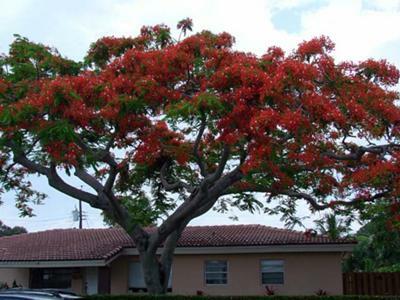 What is the name of the red flowering tree seen growing in Jamaica? I think you are speaking of the poinciana. It is almost everywhere in Jamaica and grows what we call the 'shake shake', which is simply the flower becoming a mature fruit. The flower itself is beautiful and fern-like. The tree blooms are in red flowers but there are varieties which blooms orange and yellow flowers. Typically, blooming season ends in September. Please click here to see more pictures of our Jamaican flowers.